Hallo everyone! First let me thank you all for sticking with me during my absence this past month! Life just seemed to take over and my feet barely touched ground. I am however seeing a light at the end of the tunnel, and as soon as I get rid of this cold that's been bugging me all week, I'm hoping things will return to normal and I'll be able to post regularly again! 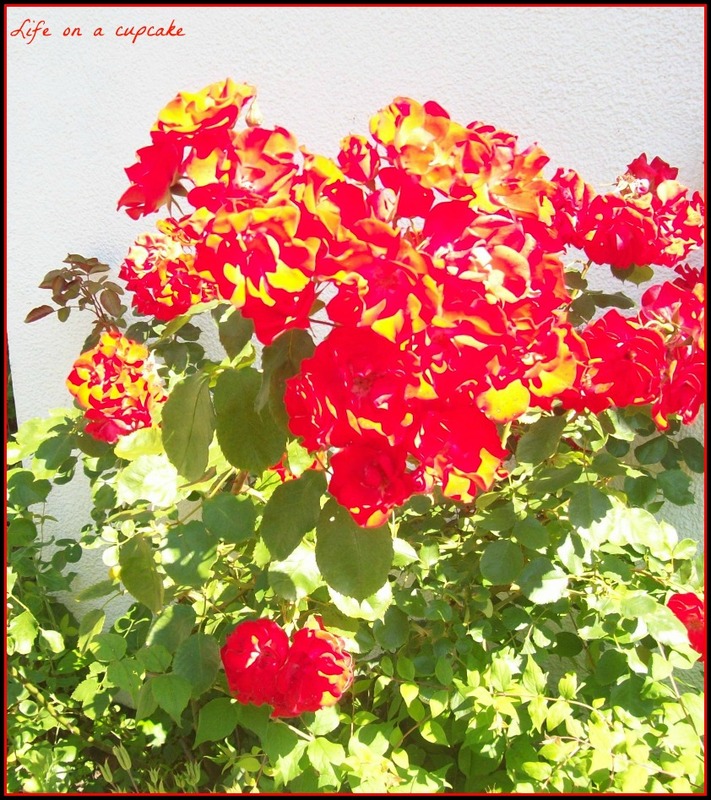 Now, back to business.......what does these flaming red roses remind you of? (I promise I did not even doctor the photo, don't they look gorgeous in the bright sunshine?) Of course! Today is the BIG day! The living room has been cleaned and everything in place, the food and drinks organised, and the do-not-disturb-sign is on the door..... it's the start of the Olympics today!!! Yeah! We LOVE the Olympics and being here in the UK where it's all taking place makes it just that much more exciting! So, for the next two weeks the boys and I will be glued to the tv-screen. If you plan on watching the Olympics; or better yet, are lucky enough to have tickets and will be attending some of the events, enjoy every minute of it all!! Go team SA and team GB! !